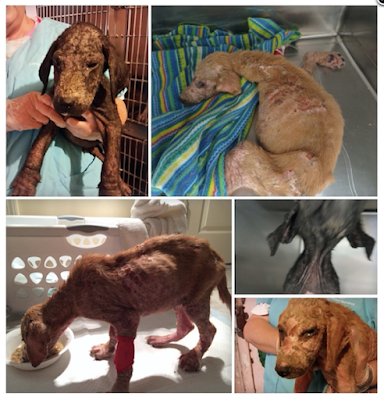 Hearts to the Rescue: BENNETTSVILLE, SC... Two 10 w/o Puppies Starved in CRITICAL CONDITION. Need Major Medical Care in ICU. PLEASE, Help Us, Help Them, by DONATING. BENNETTSVILLE, SC... Two 10 w/o Puppies Starved in CRITICAL CONDITION. Need Major Medical Care in ICU. PLEASE, Help Us, Help Them, by DONATING. TANGO & CASH - Two starving puppies need your help... now. *From Noah's Ark Rescue: BENNETTSVILLE, SC.....Puppies are always the sweetest little Angels walking the face of this Earth. Even when they chew up something, we love them anyway. All they want to do is run, play, sleep and eat. How anyone could sit back and allow innocent puppies to starve to death and suffer is something I will never be able to comprehend. Tango and Cash were picked up as strays and taken to The Humane Society of Marlboro County. Tango, the brown puppy, was not strong enough to even stand up. The Vet said this is the worst case of Mange and abuse he has ever seen in puppies. These two sweet pups are only ten weeks old and look like they are old and ancient. The pictures I received did not even begin to describe the horror these babies had endured. I immediately had then taken to our Vet where they were put in Critical Care. Tango is the worst and is barely holding on. He has already had a transfusion and is on a daily amount of Hetastarch to stabilize his blood levels. Sweet little Cash is anemic but does not require a transfusion at this time. Both pups are loaded with intestinal parasites that are taking large amounts of their blood to survive. The Mange is so bad that the skin is one big infection. These two little innocent pups are each in critical care and need all the help we can supply to get them through this terrible ordeal. We have to monitor closely their food intake, so they do not develop Refeeding Syndrome. The next five days are going to be critical for them to survive this. Please, keep them in your prayers and DONATE whatever you can so they get the best possible medical care to survive. Each pup is as sweet as can be. They are not feral puppies that shy away from humans. They love being held and loved. This alone tells us they were around human contact and were starved by someone. If you would like to DONATE to TANGO & CASH'S Medical Bills, please, click on the link below.